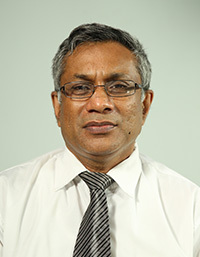 G.N.Wikramanayake, D.D. Karunaratne, Dilkushi S. Wettewe, (Jan 2012), "Evaluation of English and information technology skills of new entrants to Sri Lankan universities"
N D Kodikara, D D Karunaratne, S T Nandasara, G K A Dias, A.H. Thalagala, (2009), "Information Communication Technology Grade 11 Ministry of Education Sri Lanka "
N D Kodikara, D D Karunaratne, S T Nandasara, G K A Dias, A.H. Thalagala, (2009), "Information Communication Technology - Grade 10 Ministry of Education Sri Lanka "
Human computer interaction (HCI) is currently aimed at the design of interactive computer applications for human use while preventing user frustration. When considering the nature of modern computer applications, such as e-learning systems and computer games, it appears that human involvement cannot be improved only by using traditional approaches, such as nice user interfaces. For a pleasant human involvement, these computer applications require that the computers should have the ability to naturally adapt to their users and this requires the computers to have the ability to recognize user emotions. For recognizing emotions currently most preferred research approach is aimed at facial expression based emotion recognition, which seems to have many limitations. Therefore, in this paper, we propose a method to determine the psychological involvement of a human during a multimedia interaction session using the eye movement activity and arousal evaluation. In our approach we use a low cost hardware/software combination, which determines eye movement activity based on electrooculogram (EOG) signals and the level of arousal using galvanic skin response (GSR) signals. The results obtained using six individuals show that the nature of involvement can be recognized using these affect signals as optimal levels and distracted conditions. Learning is a psychological experience one receives to make behavioral modifications to improve his/her capabilities while gaining knowledge or skills. Even though the traditional learning is a teacher-centered pedagogical instruction, the modern learning framework is centered under a student-centered LMS and thus it is weak in cognitive, emotional, behavioral and social measures. Meanwhile, more research work has been conducted to improve the pedagogical factors under themes of adaptive and personalized eLearning. However, none of these solutions are capable of responding to a learnerâ€™s psychological reactions while delivering an adaptive content. This paper proposes an architecture to fulfill this need by integrating the techniques and knowledge from cognitive science disciplines to the modern eLearning framework. E-Learning offers a wide spectrum of learning experiences to the modern information society. As a result, the conventional classroom-based teacher-centered pedagogical learning paradigm has evolved to a learning management system (LMS) based student-centered learning paradigm. An important drawback of this paradigm shift is that the modern elearning is weakened in providing a pedagogical learning experience with enriched set of measures with cognitive, emotional, behavioral and social factors. This paper proposes a behavior-based cognitive architecture to enrich the e-learning with the pedagogical measures, so that the learner can experience a more concentrated (meditative) and more personalized learning exercise. In addition, the paper discusses the achievements of the cognitive science framework to convince the feasibility of the proposed architecture with respect to the available technologies.